Nutmeg Essential Oil has a rich, spicy, sweet, woody scent. It is similar to the cooking spice, but richer and more fragrant. Nutmeg Essential Oil is derived from the evergreen tree capable of growing 20 meters in height. It produces a fleshy red fruit. The exterior husk is dried and produces mace essential oil, while the seeds produce the Essential Oil. Nutmeg Essential Oil can be used as a treatment for the following: arthritis, constipation, fatigue, muscle aches, nausea, neuralgia, poor circulation, rheumatism and slow digestion. It is a valuable addition to many aromatherapy blends, adding warmth, spice and inspiration, when used in very small amounts. 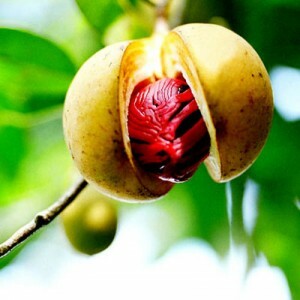 Nutmeg Oil can be used in soaps, candle making, dental products and hair lotions. Nutmeg was used by the Indians for intestinal disorders, by the Egyptians in embalming and by the Italians during the Plague. In the Middle Ages nutmeg was grated and mixed with lard as an ointment for piles. If used in large amounts, Nutmeg Essential Oil can cause toxic symptoms such as nausea and tachycardia. Avoid use during pregnancy.